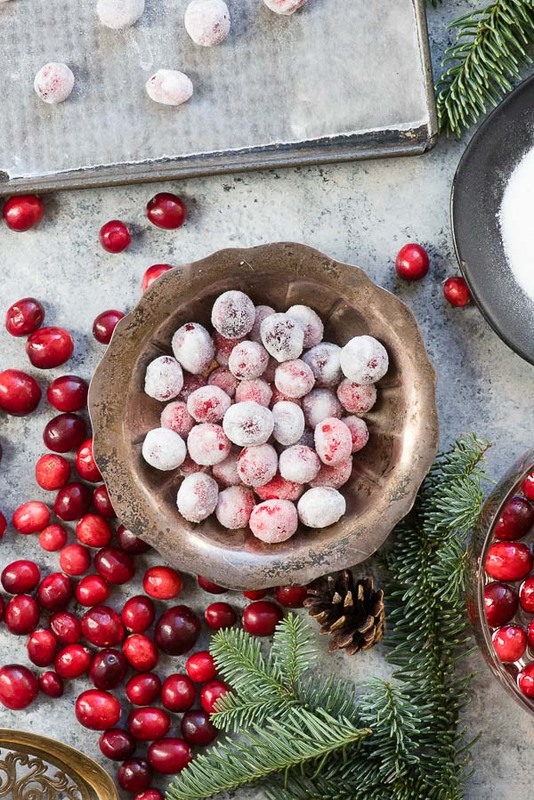 Sugared cranberries are a wonderful holiday treat and add an extra festive touch to baked goods and cocktails (or mocktails). 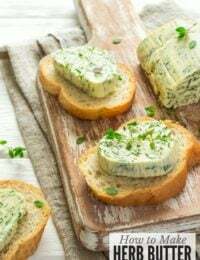 They are easy to make and once you make a batch you’ll be hooked. Fun gift idea too! I can’t think of anything more festive for the holiday season than cranberries. They segue from Thanksgiving cranberry sauce to all sorts of fun home decorations and edible treats. Has anyone strung them as a garland for your Christmas tree? How about floated them in a beautiful bowl of water with some floating candles for a centerpiece (they float just like the candles)? Just having a bowl of them sitting out feels like Christmas to me. 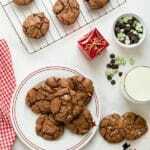 Outside of being a key ingredient in so many sweet and savory recipes, there are fun, easy recipes to prepare them as a treat or a small gift. I shared a recipe for Brandied Cranberries some time ago that I found in a vintage recipe collection. 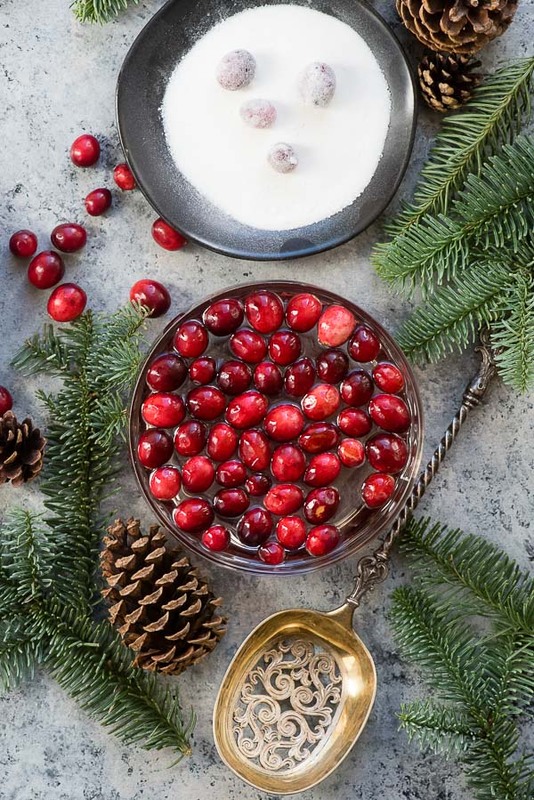 Today I’m sharing another holiday favorite: How to make Sugared Cranberries. I’m sure you’ve seen the white sparkly orbs with some red showing through in photos or on fancy desserts. 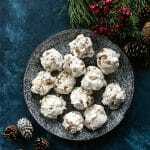 They are wonderful on cakes and cupcakes, in drinks (though they lose their sugar coating) or anywhere you are feeling it (like my Instant Pot Gingerbread Steel Cut Oats). The process of sugaring the cranberries is easy and transforms their texture as well as flavor. The cranberries soak in a homemade simple syrup recipe overnight and then are rolled in fine baking sugar (it coats the best). The simple syrup both infuses some sweetness but also creates a coating on the cranberries allowing the extra fine sugar to stick. After sitting to fully dry for about an hour, the outer coating becomes dry and crisp creating a wonderful ‘pop’ in your mouth when eating them. 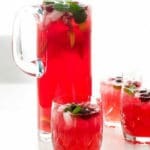 The infusion of the simple syrup coupled with the sugar coating diminishes the usual tartness for a sweeter cranberry bite. Not all cranberries are created equal, so there may be a tart one in the bunch! Once dried, their coating becomes hard so the sugar stays in place too. 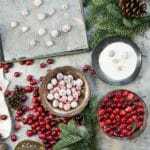 The easy trick about this recipe is that all you need to rememember is to use the same amount of water, sugar and cranberries. Simple syrup is made with equal parts of water and sugar, and this tutorial for how to make sugared cranberries uses the same amount also of cranberries. This makes it simple to create batches of whatever size you need without having to remember measurements. Giving a little jar of them as an unexpected gift for a friend or neighbor, especially one who loves to bake, is always appreciated. Of course if you want to keep them all for yourself, I’ll never tell. 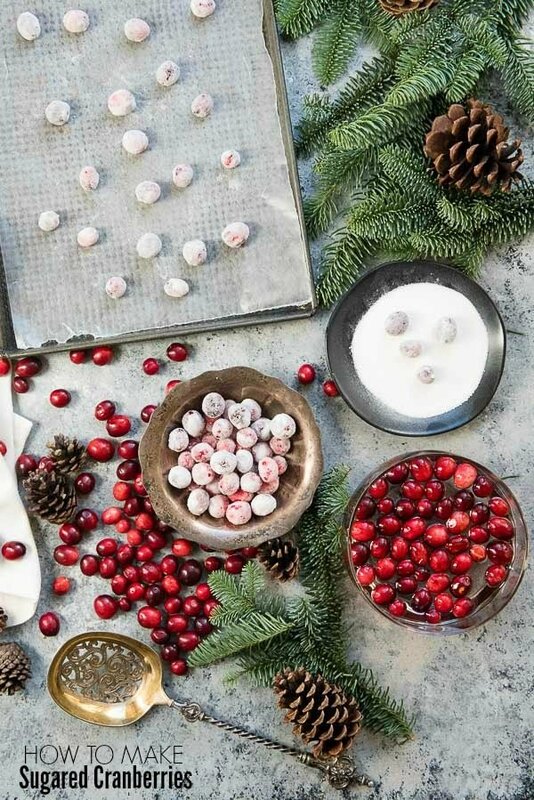 Sugared cranberries are easy to make and a wonderful holiday treat or holiday garnish. The recipe may be made for any amount of cranberries. Just adjust to the amount of water, sugar and cranberries are the same and proceed with the recipe. The volume of 1 cup has been used as an example in this recipe. Combine the granulated sugar and water in medium sauce pan and bring to a low simmer (aproximately 3 minutes), stirring often, just until the sugar is dissolved; remove from heat. Add the cranberries. Add the liquid (now a simple syrup) and cranberries to a sealable container and refridgerate for 8 hours. After chilling: Pour the extra fine sugar onto a plate. Remove the cranberries from the liquid with a slotted spoon to drain and deposit a few at a time into the fine sugar. NOTE: the simple syrup may be reserved for use in cocktails. Using a light touch, roll cranberries one by one in the sugar to coat. Gently place on a rimmed baking sheet for 1-2 hours until fully dry. 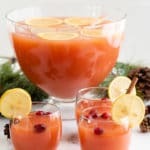 I love anything that involves Cranberries and this looks amazing! These are so perfect for the holidays! 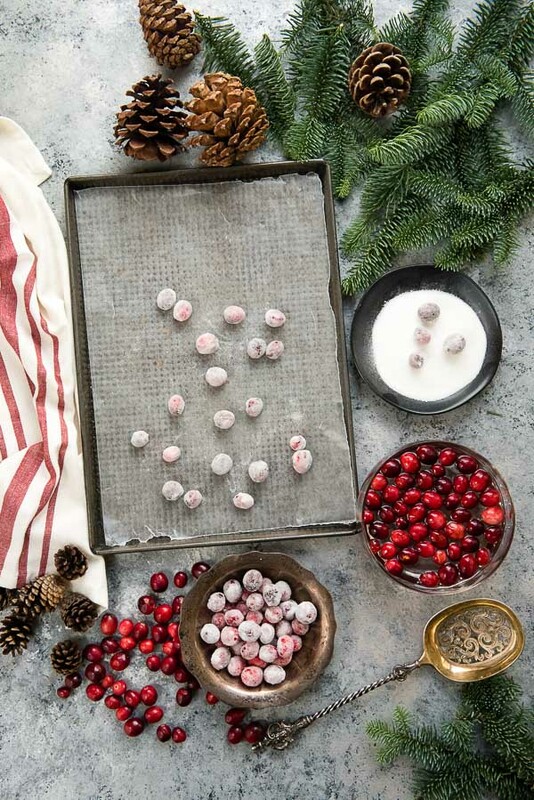 Sugared cranberries…what a novel idea!!! Wow these are pretty elegant. I never had sugar cranberries super festive. I would definitely try to make these! I’ve never tried any but I love cranberries. Give me a recipe I will not likely mess up, and I’m all over it! I really like the idea of giving them as treats. I love how easy these are to make. These will be a wonderful addition to my Christmas table. Yes! Whether for decor or eating, they are a perfect fit! Wow these look really, really cool! I am going to have to try this. Please do! I think you’ll see how many ways you can use them! Please post the recipe for the brandied cranberries! You have my attention!!!!! Thank you….I love your recipes!!!!! Just passed your site to my two Broomfield daughters!!! They are missing too many goodies!!!!!! Hi Dee! Thanks for passing BoulderLocavore.com along! If you click on the link in the blog post (where it says Brandied Cranberries) you’ll land on the recipe! Alternatively you can use the search function too. That is really good to know. I might sugar up some other things too!